RICHMOND — The Fourth Circuit Court of Appeals is set to hear arguments this week both for and against ‘Choose Life’ license plates for North Carolina drivers, as the battle over the plates continues to rage between state officials and the American Civil Liberties Union (ACLU). As previously reported, last December, a federal judge appointed by Ronald Reagan ordered the state of North Carolina to stop producing pro-life license plates unless it also makes available plates that favor abortion. U.S. District Court Judge James Carroll Fox said that the current “Choose Life” plates amount to “viewpoint discrimination” and are therefore unconstitutional. “This court concludes … that the states’s offering of a Choose Life license plate in the absence of a pro-choice plate constitutes viewpoint discrimination in violation of the First Amendment,” Fox wrote. He pointed to the 2004 case of Planned Parenthood v. Rose, in which the 4th Circuit Court of Appeals, which covers Maryland, Virginia, West Virginia, North Carolina and South Carolina, declared unconstitutional a law that allowed the creation of “Choose Life” license plates. The ruling, written by Judge Michael Luttig, appointed by George H.W. Bush, with a concurrence of two Clinton-appointed justices, stated that both viewpoints surrounding abortion must be represented in order for the law to be permissible. 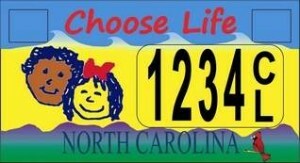 But Bobbie Meyer, director of the Carolina Pregnancy Care Fellowship, told reporters that the pro-life license plates are a beneficial source of revenue for organizations that seek to save life. In response to the adverse ruling, North Carolina Attorney General Roy Cooper appealed the decision to the 4th Circuit, which is set to hear oral argument from both the state and the ACLU this Wednesday. The state began offering “Choose Life” plates in 2011 after legislators approved a measure allowing the pro-life plates to be produced. Each plate is an extra $25, fifteen of which goes to Meyer’s Carolina Pregnancy Care Fellowship, a non-profit organization that helps to fund pregnancy care centers throughout North Carolina. Reports state that some have since requested that the state also create plates advocating abortion, but those requests have all been denied. According to WGHP-TV in High Point, six separate amendments have been presented to lawmakers in the state legislature in an effort to have produced plates that read either “Trust Women. Respect Choice” or just “Respect Choice.” The legislature has struck down all six amendments as they have failed to obtain a majority vote. Currently, 29 states offer “Choose Life” plates, and North Carolina and New York are the only two that are fighting legal challenges over the matter.